GHRS spectrum of Barnard 29. Credit: Dixon et al., 2019. Analyzing data from spectroscopic instruments, astronomers have reported fundamental properties of Barnard 29, an ultraviolet-bright star in globular cluster Messier 13. Results of the analysis, presented in a paper published March 1 on arXiv.org, provide important insights into the nature of this star. 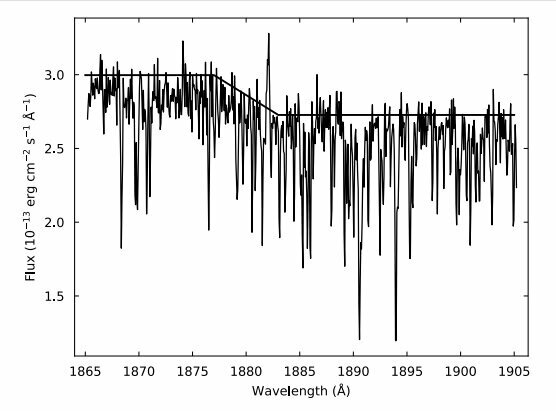 Barnard 29 has intrigued astronomers for over a century. It was described in the earliest studies as the most striking example of a star shining with a much bluer light than the great majority of the cluster's other stars. According to more recent observations, Barnard 29 is classified as an ultraviolet-bright, post-asymptotic giant branch (AGB) star. Although Barnard 29 has been a subject of numerous observations, still many questions about its evolution and chemical composition remain unanswered. So a team of astronomers led by William V. Dixon of Space Telescope Science Institute in Baltimore, Maryland, has combed through the available data from the Hubble Space Telescope's FUSE, COS and GHRS spectroscopic instruments and from the HIRES echelle spectrograph on the Keck I telescope in Hawaii. Analysis of this dataset allowed the researchers to determine chemical abundances for more than dozen elements in this star. "The availability of high-resolution, high signal-to-noise FUV and optical spectra allow us to confirm the star's iron abundance and determine the abundances of many additional species," the astronomers wrote in the paper.